It’s that time again. We’re giving away another expensive gizmo. 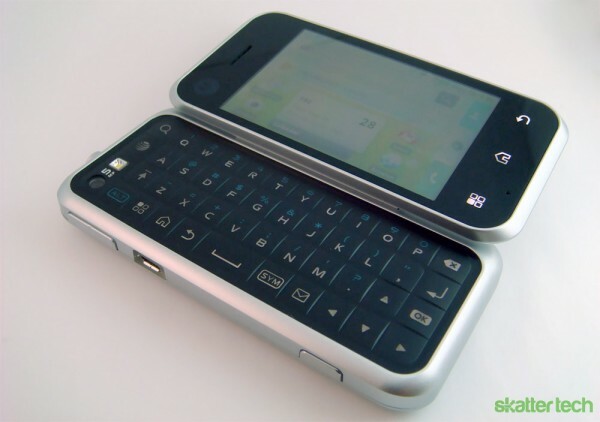 This time it’s AT&T’s one and only Android device, the Motorola Backflip. While this phone is no Droid Incredible or HTC EVO 4G, it’s still a decent mid-range phone as we stated in our review. The Backflip has a list price of $349.99, but generally goes for about $99 with a new two-year commitment. However, one lucky Skatter Tech reader will get this phone for FREE. Sign up for a chance to win and good luck! Entries close after Friday 06/11/2010 11:59 PM (PST). Winner has 24 hrs to respond to Facebook mail or Twitter DM. Phone doesn’t include service, it’s an unlocked device. That’s pretty much it. Even if you aren’t an AT&T customer feel free to enter. If you win, there are no obligations. The Backflip is yours to keep. It’s an unlocked device, you can do whatever you want with it. Use it on WiFi, sign up for only a voice plan, or throw it up on eBay for a some extra cash. If you don’t know what Facebook Connect or Twitter Connect is, it’s simple. Just click on the Facebook or Twitter icon next to the comment box below and login with the respective account. Your profile picture and name should appear once logged in properly. It’s quick and easy. Be sure to let your friends know. The more entries we get means the more giveaways we do! Update: Contest Closed, Skatter Tech will announce the winner shortly! Announcement: Congrats to Felicia (@tigpooh1516) for winning out contest! Please respond in the next 24 hours. For everyone else who signed up, there’s always next time. Seriously, we’re giving away a brand new AT&T Palm Pre Plus very soon, stay tuned.